What is Product Key Reader doing? 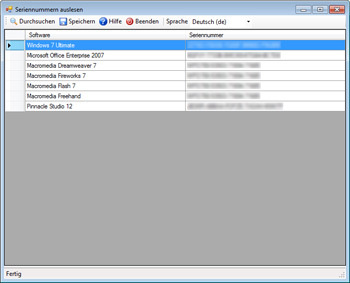 The software Product Key Reader scans your computer for product keys of installed software and creates a list of it. You can save the list as backup. Like that you'll have always a backup of your serial numbers and you'll never lose one again. To lose a serial key can be expensive. Mostly it is necessary to buy the software again, which can cost easily hundreds of Dollar. To make a backup with Product Key Reader takes a few seconds and is done with one click. Don't wait until it is too late. Product Key Reader is 100% for free. No cost at all. Just download the setup file, install it and run the program.